Snapchat is making a couple of changes today to the app that are targeted towards making it a more engaging platform. The app is officially getting group video chats and tagging or mentions in stories. Snapchat recently started testing mention tagging in Stories, a feature which has been available on Instagram since November 2016. Once tagged, viewers will get a new swipe up option on the Story which brings up the tagged person’s name, handle, Bitmoji, and an Add button. The feature is inteded to help users call out their friends or promote their favorite influencers. The feature works almost exactly like tagging on Instagram, allowing users to add text with “@[username]” to mention a particular user in their story. Just like Instagram, the tagged user is notified when they’re mentioned in someone’ story. As for group video chats, you can bring up to 15 friends (plus you) together for a video chat, while up to 32 people can join a group voice chat. 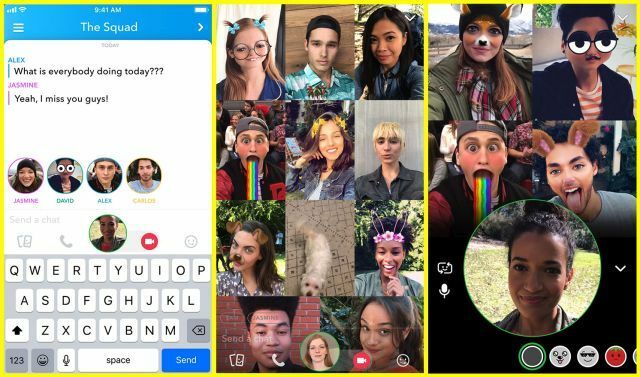 Voice and video calling arrived on Snapchat back in 2016, and the company seems bullish on this functionality to double down in this way. To start a video group chat you can use a group chat you already have, or start a new group. The video icon starts a live group video chat, while the phone icon does the voice calls. Everyone in your group will be notified about the call, and you’ll get an alert when they join in, just like one does on Instagram Live. Since this Snapchat you get to add lenses over your face.